Ken Webster began his oil industry career in 1931, shortly after graduating from the University of Pennsylvania with a bachelor’s degree in civil engineering. Signing on as an engineer trainee with The Texas Company (Texaco), he began his career in earnest, living and working in many refining towns throughout the United States. He joined Aramco in 1944 – while World War II still raged overseas – for what he initially believed would be only a 3-6 year contract in Arabia. This first chapter is dedicated to setting the stage for the Websters’ long stay in the Kingdom during the 1940s and 1950s. 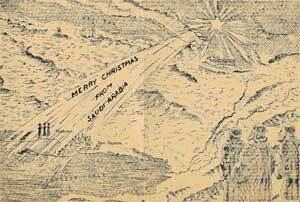 Very few letters from 1944 or 1945 survive, and with the help of articles from the Arabian Sun & Flare, I was able to tell a bit of the story of how my grandfather decided to join the company and what life was like in those first months. Mildred’s safe arrival in Saudi Arabia. Mildred Nelson and her daughters, eight-year-old Judy and five-year-old Susan, boarded an Aramco company plane, The Sphinx, on March 6, 1946. Departing New York, they traveled for the next six days, stopping several places along the way for refueling, to escape sandstorms and to allow the flight crew to rest. Daughter Judy played stewardess and young Susan adopted a stray cat. The travelers encountered a very cold Paris where wartime rationing made it impossible to bathe or get a good meal. They experienced the “luck of the Irish” with real whiskey and storytelling. They met their first Arabs in Palestine. And hit bad weather in Cairo. They finally arrived in Ras Tanura on March 11. After taking a few days to acclimate to the weather and to take in all the new sights, she sat down at her husband’s desk in the refinery office to write her first letter to her family, describing the sights she and the children had seen along the way, the tearful reunion with her husband, and her initial impressions of life in Saudi Arabia. 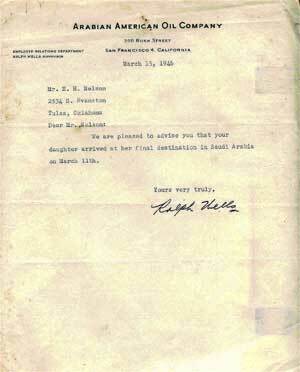 Ras Tanura, Saudi Arabia March 15, 1946 Dear Folks: I finally got to the office to get letters off – under the deadline, too. The APO will be off the 20th, so you will all have to answer by straight airmail which will cost you 70 cents – us 92 – or send it boat mail which will cost you 5 cents – but take weeks to get here. I have kept a diary of the trip and will copy it for you – that way you will all know just what we did and when – it really was fun even when it was tiresome. March 6 – They called us at 12 o’clock and we hustled ourselves around getting ready – the children had slept about 4 hours but I hadn’t at all – but I was excited and it didn’t matter – all went in one bus and arrived there about 3 – after all the passport stuff and weighing in I went to send a telegram and they gave me a corsage – it was a tremendous thrill and the flowers were lovely – I really felt like something! (We took off) at 9:15. The plane was a lovely one – a Douglas C-49 Skymaster – called “The Sphinx” – seats for 41 and crew of 6 – we only had 31 passengers. Two rest rooms, a cloakroom, storeroom and kitchen. Reclining seats – heat, even if the floor was cold, blankets and pillows. The children were not confined to their seats – and with the four other kids managed to get around and visit and not get tired. The crew was swell – and our little hostess, Miss Johnston, was a little blonde beauty – but we lost her on the first stop. Of the 31 aboard, seven were women and the six children. 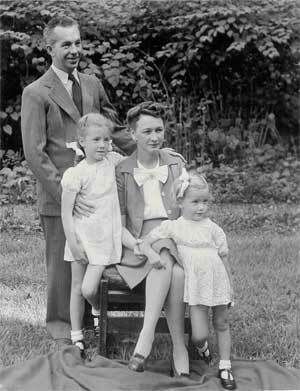 Mrs. Fulmer and her three (a girl 9, a boy 8 and a boy 2) Mrs. Spears and her boy 3 – two brides (Kiddo Hogg and June Schott) – then Lou Hausser who was meeting her husband to be in Cairo and who will live in Ras Tanura with us when they get here from their honeymoon. All were very congenial and swell sports. The children all turned out to be excellent travelers – no one was sick and they all learned to eat and sleep at all odd hours. At 2:30 we landed at Gander, New Foundland to stop 10 hours so our crew could rest. We went by bus to barracks – it is an Army camp – and were assigned to rooms. There was a club across the street with a lounge and we sat around there until dinnertime. The food wasn’t very good but welcome. We went to bed about 7:30 to be called at 11 – got up and dressed and went to the club to eat only to find we weren’t going after all – they had to wait for a part from the plane to be sent out from New York, so we went back to bed. March 7 – Got up and…found the weather in N.Y was such the part hadn’t even left there, so just killed the day getting a few things done in the room – playing bridge with the crew and the others – there was a lot of traffic through there – planes coming and going and people coming in to eat – Clippers and “Connies” as they call them – it is supposed to be the biggest airport in the world and it is very large. Susan found a cat in the barracks, so adopted it and it stayed in our room the whole time – everyone makes a fuss over the children so they are OK. The hostess adopted Judy and she helped her on the plane serving, etc. March 8 – Took off at 3:15, a little drizzly and foggy but soon cleared and we had a lovely smooth trip across the Atlantic. We made a record trip of 9 ½ hours – I really wasn’t concerned, even though I had thought I would be. Everyone spent part of the time sleeping. We landed at Shannon, Ireland at 5:30 their time – having lost six hours from N.Y. It was clear and the trip from the Irish coast in was lovely – just as you would expect – neat little farms – sod roofs – and lots of green. We had a grand dinner in Shannon: bean soup, prime ribs of beef, potatoes, fresh peas – orange pudding and coffee. I think we were all subconsciously happy we had made the crossing safely even though no one said so – a couple of the men had thought to buy Jamieson’s Irish Whiskey – we didn’t even think of it – so the bottles began to pass and everyone got sort of happy. We had Colonel Eddy with us, the American Minister to Arabia – and he came out of his shell he had been in ever since Gander – and was lots of fun. (We left for Paris and made) a non-stop flight there, arriving at 3:30 a.m. and the airport was covered with snow … it was bitter cold. March 9 – We went through the customs and passport business again and a sleepy, cold crowd all piled in a cold bus and drove 30 minutes into Paris. We went to the Palais D’Orsay – a regular palace of a hotel – we were given rooms by 5 o’clock. They had wired ahead. The place was magnificent, but no heat in it at all and I know our suite was about 10 above! We had a bedroom with marble fireplace, satin damask chairs and draperies – inlaid stuff all on the bed – a big double one – with real Irish linen sheets with cluny lace all around them – and the spread was beautiful cut work on linen – all sorts of fancy light fixtures, etc. The sitting room was just like it and they had put a single bed in it for Judy – but it was so darned cold I didn’t have the heart to put her by herself. So we kept on most of our clothes and took all the covers off the little bed and crawled in the middle of the big bed and just DIED! I guess we would be there yet but our phone rang at 12:30 and it was the gang down in the lobby – they had pounded on our door and couldn’t rouse us – we hopped up and dressed in a hurry – couldn’t bathe – no soap or water -- and met in the restaurant, but there wasn’t anything we could eat. They had cold beets for their meal and the girls had a shriveled apple apiece and I had a cup of ersatz coffee for about 80 cents. There was other stuff but nothing appealed so the children ate an orange and a couple of sandwiches I had brought from the plane. We left for the airport at 4 and took off at 5:15 to make a non-stop flight to Cairo. March 10 – You can’t come down in Rome or Athens, where we were scheduled to stop, at night because they can’t staff their airports – so we took the coastline with better weather reports – we did see the Swiss Alps by moonlight and covered with snow, but that is about all. We were due in Cairo at 5 a.m. We were there but circled the field and came down to 600 feet – then up again and down again and up until we were all getting a little apprehensive – when they announced that were was a terrific sand storm and we couldn’t land – couldn’t even see the field. We had picked up three TWA officials in Paris and they didn’t seem alarmed so we just settled down. (F)lew to Lydda, Palestine – arrived in 55 minutes and when we came down were met with soldiers with guns, etc. That is ticklish territory there and they didn’t know who we were – they took us off the plane and we had a delicious breakfast at the RAF port there – and stayed four hours – we couldn’t leave the field, however – we were 10 miles out from Tel Aviv – a lovely English garden in front of the port and our first Arabs. Our trip back to Cairo was longer and very rough and very hot over the desert – but very pretty to see – the Mediterranean in the distance and the lovely orange groves and neat little farms all underneath. Arrived in Cairo at noon to find a lot of sand yet in the air and the wind blowing a gale. We rushed into the (air)port and the storm came up again so that you couldn’t even see the plane. They said the worst in 20 years and the officials were apologizing that we should see Egypt at its worst on our first trip. We were definitely very weary! Took off for Arabia at 12. 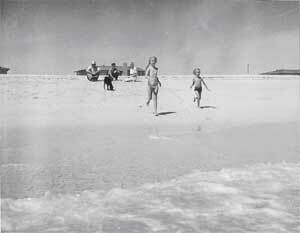 March 11 – We were all excited when we took off and they expected to reach Dhahran at 6:30 next morning. So we all settled down for a snooze – I didn’t think I could but was glad I did – at 4:30 they turned on the lights and told us we were coming down an hour early. Well, the men all had a swell time kidding us and we all got busy powdering and fixing up and bless Patty when we landed there wasn’t a soul there to meet us They didn’t even know the plane was due. It was rumored for days and the whole town had been out the day before and the men had been there on and off for days. But finally gave up and went home – so there we were with an Army lieutenant and a bunch of Arabs to meet us! The men did razz us then! They called Dhahran right away and pretty soon they all began to arrive and what a happy reunion for them…. gift by the men assigned to Ras Tanura. The Stapletons (Mr. and Mrs. Vic Stapleton) took us under their wings and took us to their house to wait for the boys. We cleaned up in their darling house and had a delicious breakfast. The place is very pretty with its shrubbery and oleanders and flowers – I was agreeably surprised. Pretty soon up came the boys in a cloud of dust and then everyone was happy – Ken looks fine – is much heavier and is almost white headed – but very brown and looks in the pink — he was so happy to see us almost all of us were in tears, including the Stapletons! After a while we started to Ras Tanura – and it wasn’t a bad trip – the boys had snagged cars so we didn’t have to make it a jeep. Art Johnson was with Ken and drove us back. Our apartment is very roomy and nicely furnished – in fact I am surprised…it is all much nicer than I expected and know we shall be very happy here. We settled our luggage in the he apartment and went to the family mess hall for a most delicious dinner with all sorts of service. There are three “boys” and they really wait on you. The kids will be rotten. They are all fascinated by children and love them. We drove out to the houses, which are grand – ours is right on the beach and believe me, the Persian Gulf is beautiful. It is about four shades of the most gorgeous blue you have ever seen and the sand is white and fine. 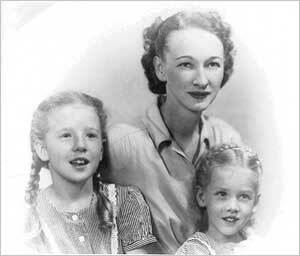 her young daughters, Judy, left, and Susan.